The Junior After School Golf Programs at The Ultimate Golf School are an excellent way for your young golfer to finish their day. They’re outdoors, staying active, and enjoying a great game with their friends. This Spring program is a 10 session instructional camp that finishes with a two-hour on-course scramble tournament on June 2. 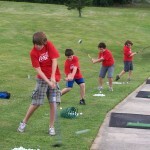 We learn and work on all aspects of the game including the full swing, pitching, chipping, and putting. We also require each player to know and understand basic golf course safety and etiquette which is discussed daily.